Two Cents and Sense: Cincinnati Bearcats vs SMU — OhVarsity! It may not always be pretty, but it’s almost always been enough. Despite facing a sub-100 KenPom team and despite playing at home in front of a sellout crowd, the Bearcats never quite took the reins on Saturday night in Clifton. Cincinnati did what they do, however, and won. They’re 19-3, and—barring something very unusual—will make their 2018-19 debut in the AP Poll Monday. Raise your hand if you thought this team would be ranked in February. If your hand is raised, put it down. You are lying. It was an impressive game from an SMU team that currently sits at 12-9. I came in worried about their perimeter shooting. They made them, but their solid 10-for-28 (35.7%) success rate actually moved the needle in the right direction for a Bearcat defense that’s giving them up at a poor 36% rate. (It’s starting to look like this issue is simply not going to go away.) What kept SMU in the game was their two-point shooting. They shot 16-for-32 inside, a torrid mark against a UC defense that’s top-15 nationally at defending those shots. The Mustangs seemed to hit a lot of junk. On the road, this is probably a game the Bearcats lose. It was simply that kind of night for the Ponies. Thankfully, it didn’t matter. The usual suspect was driving the steamroller for the Bearcats. 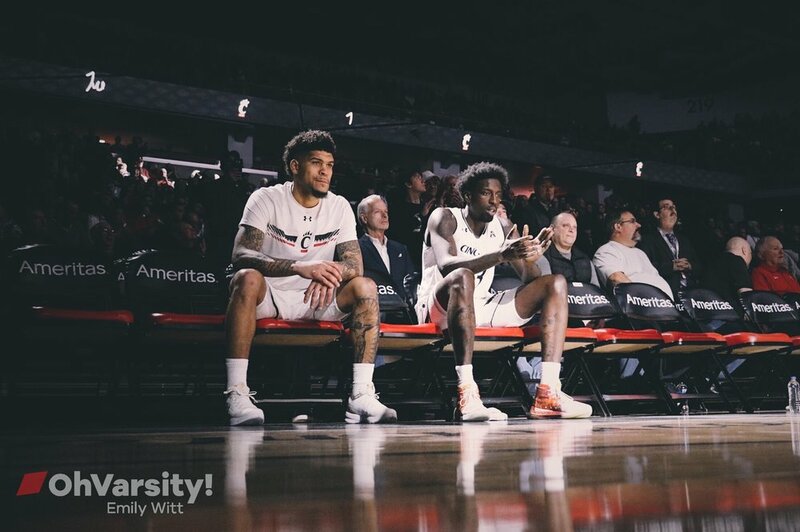 Jarron Cumberland’s AAC Player of the Year candidacy is starting to look like a runaway, especially if the Bearcats keep winning at their current clip. If you’re feeling bold, he’s probably in some national conversations as well. He’s turning into a player that’s immensely fun to watch. Not in a “wow, another 18 points” kind of way, but in a “spend five minutes following him on the court and you’ll be entertained” kind of way. Last night was one of the better games of his career, another impressive chapter for a player hitting his stride. It feels like every game he’s getting better, smarter, and more confident. It’s hilarious to imagine Mick Cronin publicly begging for him to “carve guys hearts out,” because that’s all he’s been doing recently. He racked up 24 points, nine rebounds, and five assists last night. Through the first nine games of this season he was averaging fewer than 15 points per game, and he felt a little underwhelming if I’m being honest. His season average has swelled to 18.7, he’s scored 20 or more points in five of his last six games, and he’s averaging 24.3 points, 6.0 rebounds, and 4.2 assists per game over that period. He’s officially surpassed “best player on the team” status and entered “damn, this kid is good” territory. It’s stunning how close he’s come to Sean Kilpatrick’s dominant All-American senior season as just a junior. As a point of reference, SK’s senior-year PER (Player Efficiency Rating) was 26.2. Jarron is clocking in at 24.7. Those serve as the top two among all Bearcat guards and wings since 2009-10. The comparison between Senior SK and Junior Jarron was obvious. Count me among those who did not expect them to be this comparable. Another conversation deserves to be had about how good Keith Williams has been. His sophomore-season charge continued with another 13 points against the Ponies, bringing his season scoring average back to 11.0 per game. He’s scored in double figures in seven of nine AAC games. A huge boost came from the bench, which has been an area of (very minor) concern for me this season. Cane Broome looked like Cane Broome, contributing 11 points, three rebounds, two assists, a steal, and a block. Trevor Moore gave us another early glimpse of his possible future, hitting a trio of outside shots. He has the stroke. He has the defense. He has the energy. If he can start to piece it together when it counts, he’s going to give this program a serious weapon at some point in his career. The bench didn’t commit a turnover, which feels important on a night Cumberland coughed it up five times. The starting bigs combined for just eight rebounds. Otherwise, any struggles this team had on Saturday were the usual: Poor officiating, inconsistent free-throw shooting, and a defense that’s shoddy by Cincinnati standards in some areas and embarrassing by national standards in others. Mick Cronin still deserves a trophy for ensuring these struggles don’t translate to losses. I don’t think there are five more impressive coaching achievements in America this season. The rebuilding Bearcats are 19-3, soon to be ranked. This week’s games at Memphis and Houston are going to be really fun. Lethally stressful, but fun.